Hanna Boys Center announced that Mary Jo Potter is the 2017 winner of the Hanna Community All-Star Award - given to the individual who most aptly demonstrates selfless commitment and devotion to Hanna’s ideals, mission and goals. This year’s awardee was named at the 11th Annual Evening with the All-Stars gala on April 22 in Sonoma, CA and was presented by former Hanna Board Chair Jack Bertges. 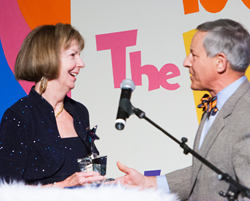 Mary Jo Potter accepts Community All Star Award from former Hanna Board Chair Jack Bertges. Hanna Boys Center http://www.hannacenter.org announced that Mary Jo Potter is the 2017 winner of the Hanna Community All-Star Award. The award is given to the individual who most aptly demonstrates selfless commitment and devotion to Hanna’s ideals, mission and goals. This year’s awardee was named at the 11th Annual Evening with the All-Stars gala on April 22 in Sonoma, CA and was presented by former Hanna Board Chair Jack Bertges. As a consultant and investor, Potter has been actively involved in the healthcare industry for more than 30 years. Having sold her initial company to McGraw-Hill, she has started and sold a number of subsequent organizations, and has been an active investor in early stage innovators in health care. She has also served on several boards, including CHW/Dignity, CHI, CHRISTUS, Ocular Sciences, the University of California School of Public Health and three other private companies. Potter’s education credits include Stanford University’s Executive MBA program, a Master’s in Public Policy and Education from Northwestern University, and a Bachelor’s in Sociology and Philosophy from Siena Heights University. One of the highlights of her career, however, is her dedicated work with charities and non-profits. Along with serving on the boards of seven non-profits, Mary Jo Potter has been actively involved at Hanna Boys Center for nearly 25 years. She has served as the Board Chair, been involved in strategic planning, served on the most recent Capital Campaign Committee, chaired multiple Board committees, and volunteered at countless Hanna events. Her service and value to Hanna has been immeasurable.